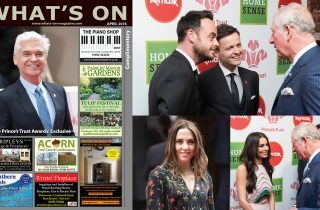 What’s On Magazine April 2018 is out now with an exclusive from The Prince’s Trust Awards. 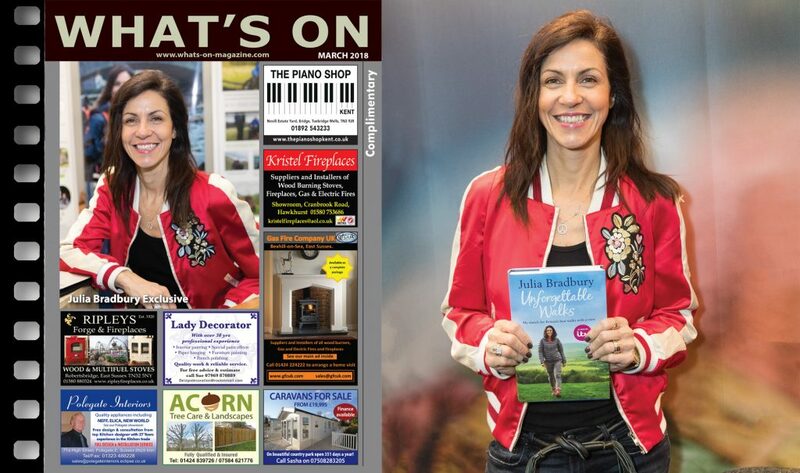 You will also find a comprehensive list of forthcoming events for April in your area as well as many London exhibitions. 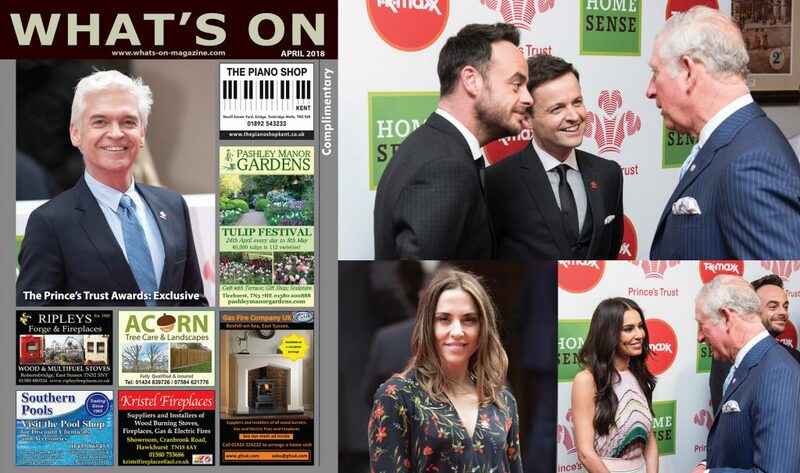 Ant & Dec hosted the annual Awards, attended by guests including Olivia Colman, Helen McCrory OBE, Cheryl, Sir Tom Jones, Bryan Cranston, Tom Hardy, Thierry Henry, Phillip Schofield, Olly Murs, Laura Whitmore and Caroline Flack. HRH The Prince of Wales, founder and President of The Prince’s Trust, attended The Prince’s Trust and TK Maxx & Homesense Awards national final, held at The Palladium in London. 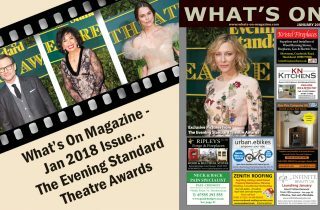 A series of regional events took place in November 2017 and culminated in a red-carpet ceremony hosted by Ant & Dec at the national final at the London Palladium. Eight awards, including the Homesense Young Achiever of the Year Award, were given out by celebrity presenters, including Prince’s Trust celebrity Ambassadors. Among them were actress Olivia Colman, singer and TV presenter Cheryl, actress Helen McCrory OBE, singers and The Voice mentors Sir Tom Jones and Olly Murs, Breaking Bad star Bryan Cranston, actor Tom Hardy, ex-footballer Thierry Henry, and TV presenters Phillip Schofield, Laura Whitmore and Caroline Flack. Daisy McDonnell, 22, from Bransgore, was the winner of the Homesense Young Achiever of the Year Award. Daisy was facing homelessness and grief, and feeling very vulnerable. “After a traumatic and harrowing bereavement, the collapse of my relationship and the reclaiming of my apartment, I began to give up hope. Trying to hold down a full time job while living on the streets proved extremely difficult. “The people that were around me during that period of my life were volatile at best, on several occasions becoming increasingly dangerous and aggressive. I felt like there were situations where I could have died. After the death of a very close friend Daisy sought help, and the Clockwork Sanctuary, a homeless day centre, suggested she take part a Princes Trust programme. Daisy enrolled on the Team programme – a 12-week course that builds the confidence and employability skills of unemployed young people. “Team became the one constant I could look forward to. And I did. Every single day. Youth charity The Prince’s Trust gives disadvantaged young people the skills and confidence to find a job. Three in four young people helped by The Prince’s Trust move into work, training or education. The UK’s leading youth charity The Prince’s Trust helps young people to get their lives on track. It supports 11 to 30 year-olds who are unemployed and those struggling at school and at risk of exclusion. Many of the young people helped by The Trust are in or leaving care, facing issues such as homelessness or mental health problems, or have been in trouble with the law. Three in four young people supported by The Prince’s Trust move into work, education or training. The Prince of Wales’s charity has helped 870,000 young people since 1976 and supports over 100 more each day. 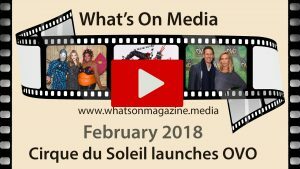 What’s On Magazine February 2018 is out now with exclusive pictures from the London opening of Cirque du Soleil’s new show OVO which is running at The Royal Albert Hall until 4th March 2018. 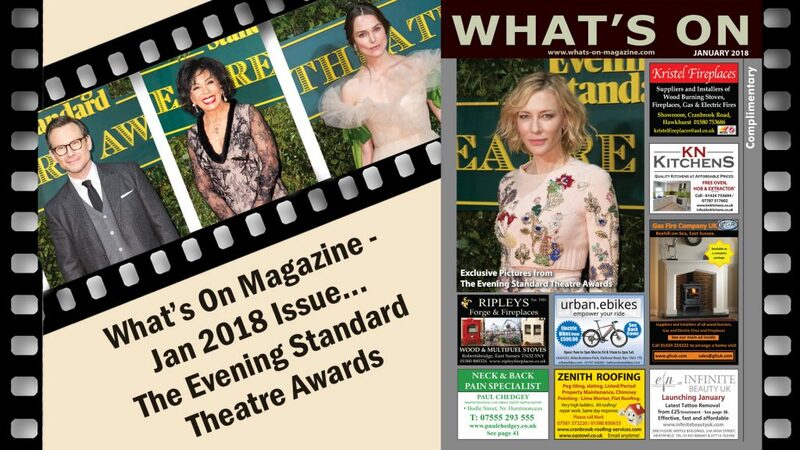 Our cover celebrity is Game of Thrones star Natalie Dormer who joined other celebrities on the press night performance. You will also find a comprehensive list of forthcoming events for February in your area as well as many London exhibitions. Celebrities including Game of Thrones star Natalie Dormer helped launched Cirque du Soleil’s latest show OVO at the iconic Royal Albert Hall, London. The show has never been seen before in the UK and is filled with a colourful carnival of crazy crickets, amazing ants and flexible fleas, OVO uncovers the natural world at our feet. Rush headlong into an ecosystem teeming with life, where insects work, eat, crawl, flutter, play, fight and love. 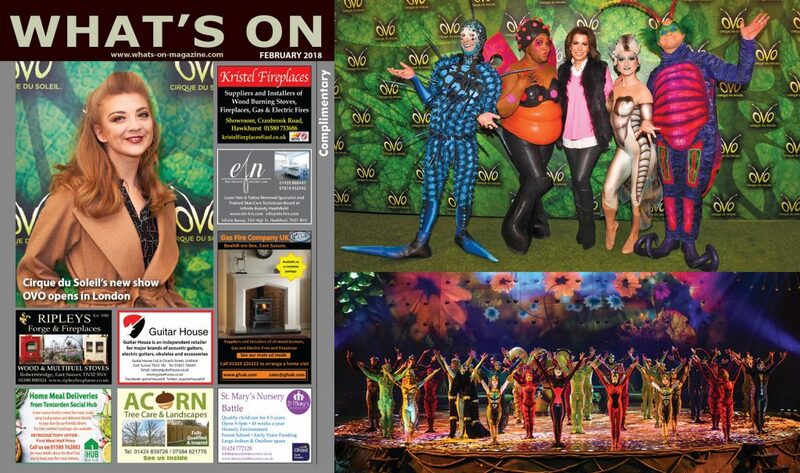 Crawling with fun, OVO is a non-stop riot of energy and movement featuring many of Cirque du Soleil’s mind-blowing signature acts including a stunning 14m high flying trapeze act – the biggest of its kind! OVO will keep the whole family buzzing! It’s love at first sight when a gawky, quirky insect arrives in this bustling community and a fabulous ladybug catches his eye—and the feeling is mutual. The name OVO means “egg” in Portuguese. This timeless symbol of the life cycle and birth of numerous insects represents the underlying thread of the show. Graphically, OVO hides an insect in its name: The two “Os” represent the eyes while the letter “V” forms the nose. • OVO is the 25th Cirque du Soleil live production created on the company’s 25th anniversary. and has visited more than 30 cities in 6 different countries as a Big Top show before transforming in an arena show in 2016. • OVO celebrated its 2000th show in February 2015 in Fukuoka, Japan. • The crew of OVO is an international one, representing 17 nationalities: Australia, Belarus, Belgum, Brazil, Canada, Chile, China, Denmark, France, Moldova, Mongolia, Russia, Spain, Taiwan, Ukraine, United Kingdom and United States. • Although you will generally hear French and English spoken on-site, many other languages are spoken: Chinese, Portuguese, Russian and more. The GQ Men Of The Year Awards 2017. Our cover celebrity is Jared Leto who can currently be seen in ‘Blade Runner 2049’. Pick up your copy or read online. You will also find a comprehensive list of forthcoming events for November in your area as well as London exhibitions. The 2017 GQ Men of the Year Awards in association with HUGO BOSS, took place at the Tate Modern, Turbine Hall, in London. Celebrating its twentieth anniversary, guests were welcomed with Laurent-Perrier Champagne and Copper Dog whisky cocktails. Canapes were provided by Social Eating House and Pollen Street House, which included: Guinness braised beef arancini with piccalilli puree, Loch Duart smoked salmon & salmon caviar, dill & cucumber cupcakes with dill oil, salt-baked beetroot & celeriac tartlet, and salt cod burger with kimchi. The twentieth annual GQ Men of the Year Awards is held in association with luxury lifestyle group HUGO BOSS for the fifth year running. In addition to the long-standing award categories presented by the magazine and category sponsors, the event sponsor has again bestowed its own awards – the HUGO BOSS Most Stylish Man Award and the HUGO BOSS Woman of the Year Award. The dinner menu, designed by Jason Atherton, began with tartare of Buccleuch Black Angus, beetroot, egg yolk, and jam horseradish followed by Ribble Valley chicken breast, truffle & leek dressing, roasted chicken fat mash and finished with a custard tart & rhubarb sorbet. To accompany dinner there was Berry Bros & Rudd Good Ordinary White and Berry Bros & Rudd Good Ordinary Claret. In addition to the Awards dinner and ceremony, there was a very special performance by Ukrainian ballet dancer, model and actor Sergei Polunin. 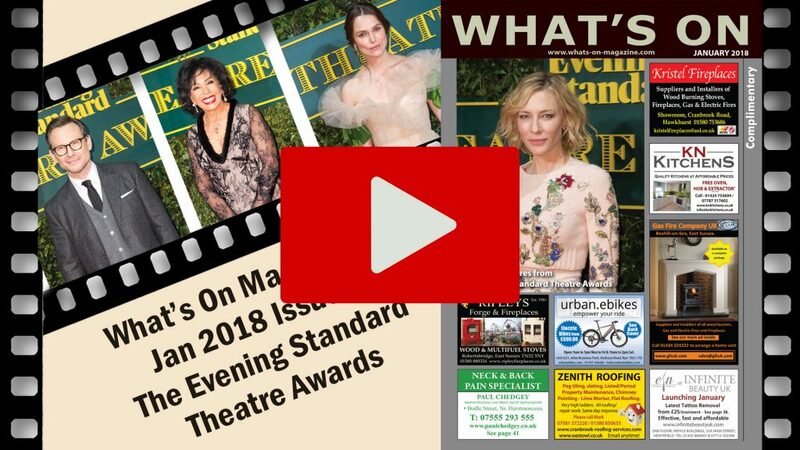 The award winning actor, who joked about how he was voted Worst Dressed Male by the mag in 2013, wore a flamboyant tweed suit as he accepted the prize – earlier he was later forced to apologise for accidentally ending the event’s live stream. Leading the glamorous ladies style at the 2017 Awards was Poppy Delevingne, 31, Anna Friel, 41, and Jourdan Dunn, 27. Poppy – who made her acting debut in Guy Ritchie’s King Arthur: Legend of the Sword arrived in her sheer haute couture Reem Acra gown with a number of embroidered stars across the chiffon bodice. Offsetting the sheer fabric, her skirt flared out to the ground in a mass of grey and black tulle with matching ruffle accents and star embroidery.